Cristina said: "[Hodges Figgis has a] very good selection of books on all subjects, with particular emphasis on works of Irish interest. A cut-price, remainder section in the basement." A sad fact lies behind Ireland's largest bookstore. While it used to be the biggest independent bookstore in the whole country, it was bought by the HMV Group a couple of years ago, the same group which owns such chains as Waterstone's and WH Smith. 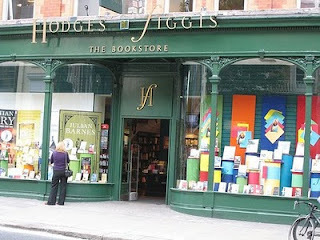 Nonetheless, Hodges Figgis has made its way to Bookstore Guide not only because of its size but also because of its long history and reputation, interesting stories behind it and, last but not the least, its immense stock. "She, she, she. What she? The virgin at Hodges Figgis' window on Monday looking in for one of the alphabet books you were going to write." Imagine being in the same bookstore as Mr. Joyce once did, and though back at the time it was located elsewhere, the store is the same, painted in its familiar green and gold, with a special aroma of a different bookstore (although no more independent). Hodges Figgis stretches out on three floors and has numerous categories of books. It used to house a coffee shop on the first floor but in the end, it was removed because the space needed to be expanded for reading purposes. Nowadays, the ground floor is dedicated to the main categories. There is also a basement with bargain books, so be sure to check it out as well. With the bookstore specializing in Irish literature, here you'll find almost any book ever published in Ireland. As for other categories, Hodges Figgins has it all, from books on gardening via books on Native Americans to study books on maternity. All in all, their stock consists of an impressive 60.000 different titles. 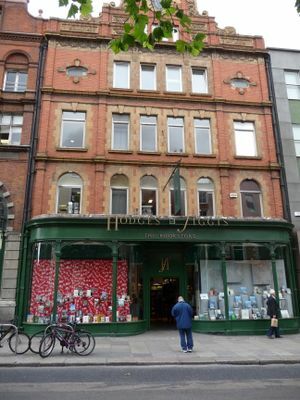 When it comes to prices, considering that the books sold here are new, they do not differ from other bookstores in Dublin. But then again, you can apply for the loyalty card if you shop here often and you'll be surprised at how much you can save. According to many customer reviews, Hodges Figgis is also known for its friendly staff and the possibility to order books which you fail to find at the bookstore.